Seeing how ViewModel state saving specifically is hooked into this system. A note before we jump into things: I’ll be showing code from the relevant AndroidX libraries, however, these snippets will all be simplified for clarity’s sake. This means that safety checks might be cut, variables may be renamed, etc. I promise that the relevant parts were kept the same, to the best of my ability. The main component we need to familiarize ourselves with is SavedStateRegistry, everything else will be built up around this class. The duty of this class is to keep track of a collection of SavedStateProviders, each of which it allows to contribute to and restore from saved state. SavedStateProvider is a very simple interface: anything that implements it can be asked to provide a Bundle of state it wishes to save. Each registered provider has to have a unique key. This key is how the state they’ve contributed to saved state will be identified, as we’ll see soon. 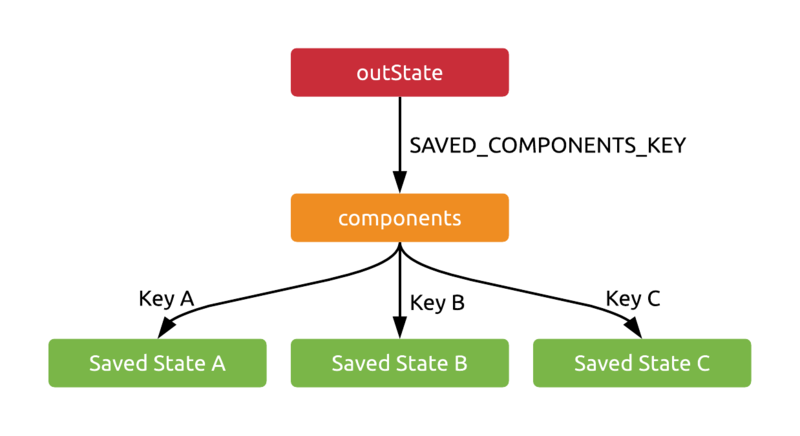 The method where state is then saved is performSave, which receives an outBundle parameter. This is the very same bundle that you get access to normally in your Activity or Fragment. A Bundle named components is created here, which will be placed in outState with a fairly unique constant key. This Bundle will then contain all Bundle instances returned by saveState calls on the registered providers, each Bundle keyed with the provider’s key. It’s Bundles all the way down! When doing so, it will have to provide its key, and will be given the appropriate nested Bundle from mRestoredState. Notice that Bundles accessed will be actually removed from mRestoredState, and if there are none left, it will be set to null altogether. It’s time for a story! To recap and perhaps better explain what happens with especially mRestoredState throughout this process, here’s an analogy. We are running a hotel. Guests may notify us upon arrival if they happen to have valuables on them (registerSavedStateProvider), in which case we jot down their names (key) to remember later. Every night, when the guests are going to sleep and couldn’t personally look after their valuables (not being awake and all), we ask them each for their valuables (performSave). We assemble a huge box, so that these valuables may all be stored in it together (components), each item labeled with the guest’s name (again, the key). We then put this huge box on a truck (outState) which disappears into the night, taking everything to an undisclosed, but secure location. The next morning, the truck reappears (performRestore), still carrying our huge box. We take the box off the truck, and we set it down in the hotel lobby (this box is now mRestoredState). If a guest comes by to claim their valuable, they have to tell us their name (key), and we take their item from the box and hand it back to them (consumeRestoredStateForKey). If the box becomes empty at any point, we throw the box away. When nighttime comes again, we might still have a box left in the lobby with unclaimed valuables in it (mRestoredState != null). We should save these securely again, for the guests may want to reclaim them tomorrow, or even the day after. We assemble a brand new box again (components), but if we still have the box in the lobby, we dump its contents into the new box (components.putAll(mRestoredState);). Then we proceed as normal, asking each registered guest for any valuables they have for us to safekeep. And so on and so forth, day after day. As fun as that was, let’s get back to the technical bits. We have a SavedStateRegistry that keeps track of SavedStateProviders, puts their state in outState, and lets them access the restored state. Who manages this SavedStateRegistry and calls its performSave and performRestore methods? Technically, the SavedStateRegistryController does, which is an extremely thin wrapper around SavedStateRegistry, and also has performSave and performRestore methods, which it just forwards to the contained registry. Fragment (the one found in androidx.fragment.app). Note: The equivalent of ComponentActivity in the old, non-AndroidX world would be SupportActivity, however that class doesn’t contain the features mentioned here. It’s important to see at this point that you could implement this interface for your own custom components that have lifecycles, and use all this save and restore infrastructure. We’ll look at the relevant parts of ComponentActivity now as an example - Fragment will be very similar in this regard. It contains an instance of SavedStateRegistryController, and implements the interface shown above by fetching the registry stored within the controller. This is all very interesting, but I’ve promised ViewModels, so where are they in all of this? Worry not, we’re just one step away from them now. 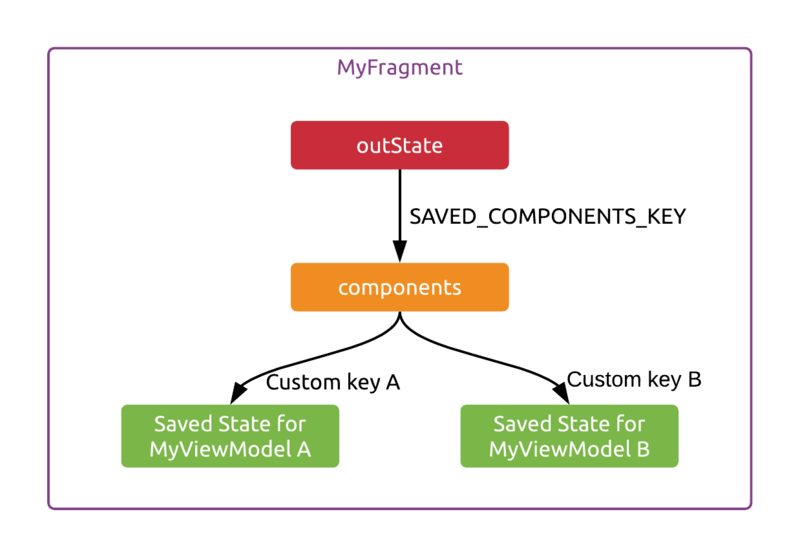 In my previous article, I’ve shown that you need to use SavedStateVMFactory to instantiate your ViewModels to make use of saved state. This isn’t exactly true, as all you really need is a subclass of AbstractSavedStateVMFactory - the former is just a simple, easy to use concrete implementation provided by the AndroidX libraries. The abstract base class is a KeyedFactory, and takes a SavedStateRegistryOwner as its constructor parameter. It stores the registry the owner contains as a field for later use. 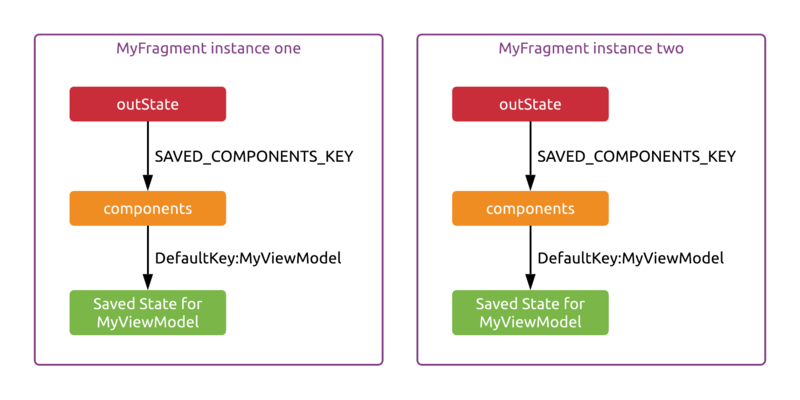 Being a KeyedFactory, it needs to be able to create ViewModel instances with two different create methods - one that takes just the Class of the ViewModel to create, and one that also takes a key. If it doesn’t receive a key, it will simply use the classname of the ViewModel that is to be created. registers this handle as a provider so that it may contribute to the next outState that will be created - I’ll spare you the details of this part, but the handle contains a provider implementation that can provide the contents of the handle as a Bundle. Finally, it creates the ViewModel instance, passing it the already initialized handle that it can use to store and retrieve data. As for this last three parameter create method, it’s actually abstract, and is free to be implemented as you wish - but it’s implemented already in SharedStateVMFactory, should you choose to use it (with plenty of reflection, as you’d expect). The factory consumes the state from the registry that it can access via the SavedStateRegistryOwner that it received as a parameter. It wraps this state in a SavedStateHandle, which contains a SavedStateProvider. It registers this provider with the register. It creates the ViewModel instance, passing in the handle as its parameter, so that it can manipulate the data stored in it. The lifecycle aware component has its state saved. The controller and consequently the registry is invoked, pulling data from all providers, including the one inside the handle. All the collected data as well as any previously restored and not yet consumed data is saved to outState. A lifecycle aware component is restored. A new registry is created, and is restored from outState (now called savedState). The only interesting detail I found in the implementation so far is that if you don’t provide a key to the get method when you’re asking the ViewModelProvider for a ViewModel instance, your saved data will be associated with the classname of the ViewModel internally (otherwise, the key is used). This means that reusing the same type of ViewModel class for multiple screens will cause their saved states to overwrite each other by default. Note that this mechanism is different from the KeyedFactory default key substitution we’ve seen above. The non-keyed get method of the factory actually doesn’t ever get called by the ViewModelProvider - it’s only there in case a developer invokes it manually, which you probably shouldn’t do. With the ViewModel’s name being the chosen key, this is what AbstractSavedStateVMFactory will use as the key when accessing the SavedStateRegistry. Having multiple Fragments with the same ViewModel type won’t be an issue, however - as their outState Bundles are completely separate instances! There would only be an issue here if you had two of the same class of ViewModel within a single Fragment - but there’s probably no good reason to do this. And if you do, you can still provide your own custom keys for them to separate their instance state. That’s it for now! Thank you for reading, I hope you’ve learned something interesting. For even more detail, I encourage you to jump into the source yourself - it’s actually quite easy to navigate after you grasp the overall structure of the many classes involved.